Living Hope’s new video system is composed almost entirely of high-performance Panasonic components. BOWLING GREEN, KY—Living Hope Baptist Church in Bowling Green, KY is not unlike other mid-sized churches. “Although we had always been happy to embrace new audio and video technologies over the years, the fact that we had fallen behind crept up on us slowly,” said the church’s creative arts pastor, Jon Farmer. In order to stay true to the church’s stated relationship with supporting technologies—“to better connect people with our message,” in Farmer’s words— Living Hope recently undertook a significant overhaul of its video system. Aided by the experts at dB Audio and Video of Gainesville, GA, the church now has a full HD presentation and recording system centered on Panasonic cameras, switchers, and projectors. Despite the truly vast improvement in performance, the cost was only a fraction of what it would have been just a few short years ago. Requests from older members of the church, many of whom were confined to their homes due to mobility issues, spurred Living Hope to recognize that it wasn’t keeping pace with available technology. “During the week, the deacons visit church members who can’t attend service,” explained Farmer. “They had been bringing a recording of the service made from a single camera at the back of the worship center. It was really about as engaging as watching a tiny stickman walking back and forth against a huge backdrop. The quality of that experience left them feeling more isolated.” At the same time, the church recognized that upgrading its video presentation technology would also allow it to deliver compelling podcasts, an ability that resonated with its larger mission. “Like Living Hope, many churches are beginning to recognize the technological gulf between their services and the sort of multimedia experience that church members are enjoying in their own living rooms,” said dB Audio and Video design specialist Ron Stanford. “Expectations are changing and the bar has been raised. But in the right hands, churches can take solace in the fact that the price tag associated with a high-quality video system has fallen significantly in recent years.” In the early stages of the project, Stanford observed that improvements to the video system would require lighting upgrades in order to be appreciated, and pointed the church to a high-quality, value-oriented lighting firm, TPS of Atlanta, GA. 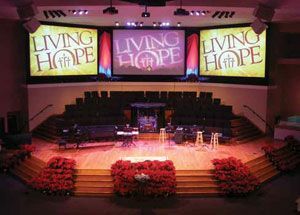 Although Living Hope’s audio system was largely up to speed, dB Audio and Video improved intelligibility with the addition of acoustic paneling that blended seamlessly with the worship center’s aesthetic. Living Hope’s new video system is composed almost entirely of high-performance Panasonic components. Two manually operated Panasonic AG-HPX370 studio-configured cameras are joined by two robotic Panasonic AW-HE 100N cameras affixed to the balcony. A Panasonic AV-HS 450N switcher with 16 inputs and four auxiliary busses completes the front end. Because all four of the cameras share a common chip set, cuts between them are visually seamless. Three 9600 lumen, high-definition Panasonic PT-DW8300U projectors shine brilliantly onto three Da-Lite Series 300 Lace & Grommet fixed frame screens, each 18 feet wide. An AJA KI-PRO-R0 video recorder captures each service or event so that it can be stored on DVD or used for a podcast.